The National Museum of China The National Museum of China runs more than 300 meters north and south along the eastern side of Tian'anmen Square. World Art Museum World Art Museum is hidden inside of the China Millennium Monument, a wonderful architectural splendor was built to welcome the new millennium. Poly Art Museum This is the first museum operated by a state-owned enterprise on China mainland. Most of its collections are retrieved from abroad. Museum of Beijing Stone Inscription Art The Museum of Beijing Stone Inscription Art is located in the grounds of Five-Pagoda Temple, 200 meters north of Beijing Zoo. 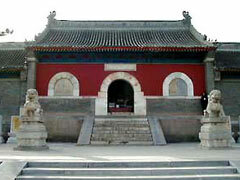 Sackler Museum of Art and Archeology Sackler Museum of Art and Archeology at Peking University is the first of its kind among Chinese universities, containing more than several ten thousands collections until now. 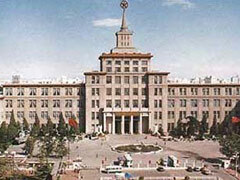 Beijing Museum of Natural History The first museum of its kind in China, The Beijing Museum of Natural history houses more than 5,000 specimens, which are displayed in the Halls of Paleontology, Zoology and Botany. China Aviation Museum China Aviation Museum is about 40 miles north of Beijing and located in the foot of fascinating Xiao Tang Hill (XiaoTangShan) in Changping County. Dabaotai Han Dynasty Tomb Museum Beijing Dabaotai Han Tomb Museum was built up in the site of the underground palace of Liu Jian , who is the Guanyanqing Feudal Prince in the Western Han Dynasty. Stone-Carved Scriptures Exhibition Hall The Yunju Temple Stone-Carved Scriptures Exhibition Hall is famous for its 14,278 stone slabs carved with the Buddhist scriptures known as the Tripitaka. 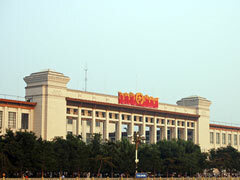 China People's Revolution Military Museum The museum is composed of two four-story wings and a main building of seven stories topped with the gilded emblem of the Chinese People's Liberation Army. 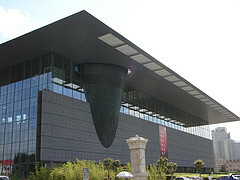 Anti-Japanese War Memorial Hall Set up in 1987, the museum is composed of three comprehensive halls, three specialized halls and one half-panorama art gallery.